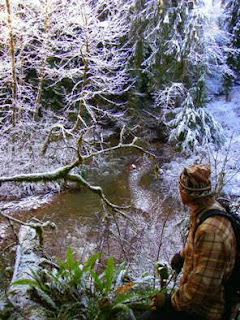 Here are some pics from Wilderness Certification Program's winter trip to the Coyote's Path property in Okanogan, WA. 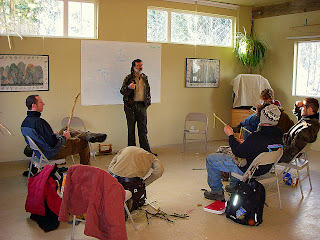 This week at the Wilderness Certification Program Hawkeye came out to teach us about giving lessons. There are different ways which people learn, and different ways to give lessons. Lessons can be learned through direct experience (sometimes hard lessons! ), through repetition, and (my favorite) through coyote teaching. We practiced all of these methods thoroughly and had a blast the whole time. We learned how to make primitive hangers too. Sometimes you need to dry things like herbs or clothes, and with the direct experience of making primitive hangers we learned that lesson. They also can serve to smoke meat if hung above a fire. Coyote teaching is a method of getting a student to answer his or her own question. Each time a question is asked, the answer is another question. It can be frustrating, especially when you know that the teacher knows the answer. But how much of what your teachers said in class do you remember? On Thursday we learned about wild herbal teas and how to draw out different nutrients and medicines from different plants. 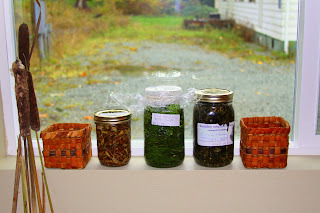 We made some dandelion root tea, which was full of vitamin A and iron. Later on we ate the leaves in quinoa veggie peanut sauce dish. We learned the difference between infusions and decoctions. Infusions are made by steeping the herb in hot water and letting it sit for a period of time. Decoctions, on the other hand, are made by boiling the root, flower, stalk, and/or leaves in the water for at least a few minutes. Karen Sherwood, our ethnobotany medicinal herbalist superwoman gave us a gift of her cold/flu formula, which is a mixture of... maybe I won't let out the secret! Friday Karen was back to teach us basketry. We used ponderosa pine needles from the East Cascades which we gathered in November. We learned different stitches and used a coiling technique, which is different than the plaiting of our cedar bark baskets. This coiling technique is used to make water tight baskets that can hold more weight. Starting the basket was a bit frustrating but once you got into the flow of things it became much more fun. These baskets will hold not only berries or other foods but our personalities for years to come. Yay! 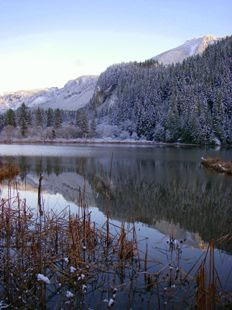 The Alderleaf Wilderness Certification Program is back from break, but the weather hasn't given us any time to relax. Over Christmas and New Years the campus got 2 feet of snow! The day I came back to campus after visiting family in Iowa (where we had 3 feet of snow) there was still some on the ground, but it melted overnight and the snow melt, as well as some more rain, flooded us out so we didn't have class Wednesday and Thursday but were back on track on Friday. We practiced ecological tracking, which is a bit like the "big picture" of track and sign; we looked at an aerial photograph of a nearby wetland (lovingly dubbed the Dam Marsh) made by a beaver damn and hypothesized about what kind of animals would be active in the area and what kind of sign we would find. 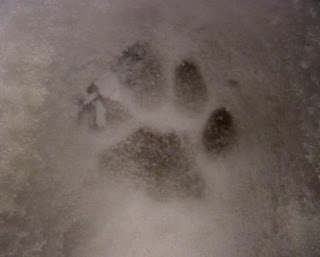 So we trekked out there and found sign of over 15 animals, some that we expected, and some that we didn't. 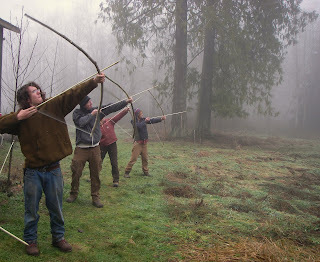 After a relaxing weekend of lumber milling we came back together to build survival sapling bows with Frank Sherwood. What a blast! It took us two full days of harvesting materials, tillering, sharpening points and making cordage but we did it. We even went "roving;" stalking imaginary game and challenging eachother to shoot faster, farther and with greater accuracy. The week came to a close with a days lesson on water purification through boiling and other means. 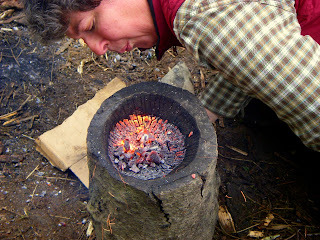 In order to boil water to kill any pathogens we first had to make our own bowls by burning into logs with coals to make a deep depression; then we filled the bowls with creek water and boiled it by adding rocks heated in the fire. We even added a few Douglas Fir needles for flavor and vitamin C. Yum! A multi-use trail through the grass across the path to the Dam Marsh. Fritz burnishing the point on his Dogwood/Black Locust arrow. Looks like fur; it's really just some beautifully formed frost on a twig. Blowing through a Teasle straw onto coals to help them burn faster. Placing the last hot rock in the dugout bowl to bring the water to a boil with Vine Maple tongs.